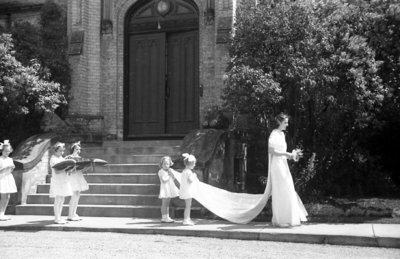 A black and white negative of the May Queen and her court at Ontario Ladies' College. The May Court Festival was first proposed to the Ontario Ladies' College by Lady Majorie Gordon, daughter of Lord Aberdeen, the Governor-General of Canada, when she visited the College in 1898. It has been an annual event since 1907. Ontario Ladies' College May Day, May 24, 1938, Marjorie Ruddy. Whitby Archives A2013_040_049A.